What's the first thing you do when you get home from work, errands or all-day play? Take off those sky-high heels or clunky boots and slip into something warm and comfortable. These stylish, plush knit slippers feature a soft, faux fur lining and indoor/outdoor sole to give you a look that's not only beautiful but blissful on your feet. This is the second pair I have bought Of these slippers. They are comfortable and warm. I am 70 years old and live in North Carolina and it does get cold here....I wear my wool socks and then I put on these slippers and wear BOTH to bed. They are so soft and keep my feet so warm...I drift off to sleep much easier than I ever did before. Thank you HSN! Gave to my daughter in law and granddaughter. Both really enjoy them. 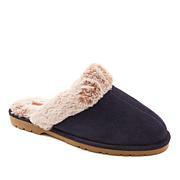 Love these slippers these are my second pair of slippers I have purchased from HSN I love them so much. They are very comfortable and I have worn mine outside all the time and they help up with no problems. 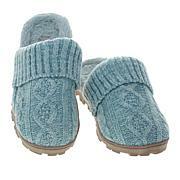 More than just a pretty face, these whimsically embroidered scuffs also feature cozy cushioning where you need it most. So slide 'em on and "keep cozy" while enjoying some "me time" and "love life"!